Photo 1. Topside of cucumber leaf with yellow lesions defined by the veins. All photos by Mary Hausbeck, MSU. Michigan is the No. 1 producer of pickling cucumbers in the nation. Pseudoperonospora cubensis is a fungal-like organism that causes downy mildew disease and can infect a variety of cucurbit crops including cantaloupe, cucumber, gourd, honeydew, muskmelon, pumpkin, squash, watermelon and zucchini. Downy mildew reemerged as a problem on cucumbers in Michigan in August 2005 when the disease spread across the eastern region of the United States and has recurred every year since then. Reports of downy mildew have increased across many counties in the southeastern U.S. in the last 10 days (as of June 30, 2017). Other states with downy mildew include Georgia, North Carolina, Alabama, Florida, South Carolina and Texas. In the northeastern U.S. and the Midwest, downy mildew has been reported in Maryland and Ohio. Downy mildew causes symptoms on the leaves (Photos 1-5). Yellow lesions may be visible on the top surface of infected leaves and may be defined by the veins. However, the telltale sign of downy mildew is the gray to black fuzz on the underside of the leaf giving a somewhat “dirty” or “velvet” appearance (Photo 2). This fuzz may be most evident in the morning. Photo 2. Underside of cucumber leaf displaying dark, fuzzy spore masses. Photo 3. Symptoms of downy mildew on cantaloupe. Photo 4. Symptoms of downy mildew on watermelon. Photo 5. Symptoms of downy mildew on squash. 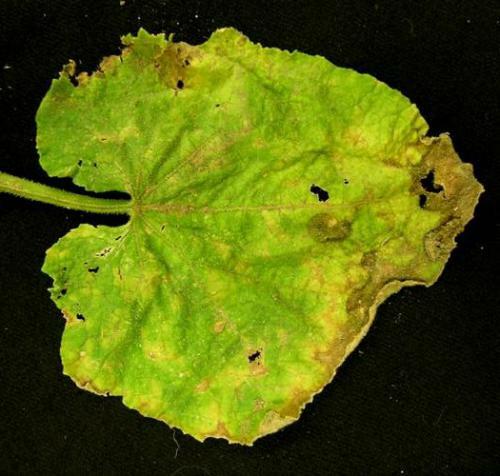 · Yellowing on top surface of leaves bound by the veins (especially for cucumber). · Velvety or fuzzy dark spore growth on the underside of the leaves. Downy mildew is well-known for causing catastrophic losses in a brief period of time. P. cubensis is an obligate biotroph, meaning it cannot live long without a host plant. This condition restricts the pathogen to warmer climates during the winter months, including southern states and greenhouses. Downy mildew spreads to surrounding fields on air currents via tiny, microscopic spores that act as seeds of the pathogen. Cool (around 60 degrees Fahrenheit), wet and cloudy conditions create an ideal environment for downy mildew spores to survive outside the host. When the conditions are favorable, unprotected foliage can become completely blighted within 14 days of the initial infection. To achieve early detection of downy mildew, the airborne spores of the pathogen are sampled using spore traps (Photo 6) placed in Michigan’s major growing regions during the spring and summer. These spore traps continuously sample the air and collect spores by imbedding them onto a film that is removed and taken to the laboratory for identification and quantification. Photo 6. A spore trap used for monitoring airborne downy mildew spores. A compound microscope is used to identify and count P. cubensis spores that are present on the tapes. The spore traps help us to detect an influx of spores into those production regions where the spore traps are located, but are not used to time fungicide sprays. There are few management practices that can be used to control downy mildew. Before the downy mildew outbreak of 2005, the disease was effectively controlled through host resistance. However, since then no cucumber cultivar has been identified that exhibits complete resistance to downy mildew. A management strategy for gardeners should focus on using preventive measures to reduce the chances that cucurbit downy mildew becomes established. Since downy mildew normally becomes established in late summer within Michigan, planting cucurbits early in the season will allow gardeners to get more fruits from their crop before downy mildew becomes a problem within the state. Reducing the optimal environmental conditions for P. cubensis growth is another option. For instance, gardeners should avoid watering at times when moisture will remain on the foliage for extended periods of time, such as in the evenings. If downy mildew becomes established in or near a garden, fungicides containing the active ingredient chlorothalonil will provide some protection against the disease. Go to Michigan State University’s Downy Mildew News for more information. If you need help identifying cucurbit downy mildew, click on the link “How to submit samples” for instructions on how to submit diseased samples to MSU Plant Diagnostics. · Plant cucurbit crops early in the season. · Water when foliage can dry rapidly. · Avoid watering in the evenings. · Fungicides containing the active ingredient chlorothalonil can be used to prevent downy mildew and slow the progression of the disease once it has become established. The pesticide label is the legal document on pesticide use. Read the label and follow all instructions closely. Using a pesticide in a manner not consistent with the label can lead to the injury of crops, humans, animals and the environment, and can also lead to civil or criminal fines or condemnation of the crop. Pesticides are good management tools for the control of pests on crops, but only when they are used in a safe, effective and prudent manner according to the label. This material is based upon work that is supported by the National Institute of Food and Agriculture, U.S. Department of Agriculture, under award number 2016-68004-24931, and by the Pickle and Pepper Research Committee for MSU, Pickle Packers International Inc. This article was published by Michigan State University Extension.